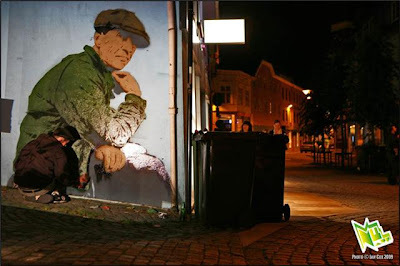 The count down has begun to this years annual international street art festival Nuart, in Stravanger, Norway. 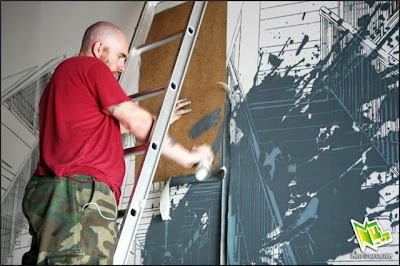 Openig on 10 September, this year is set to be their most audacious show yet with some of New York's leading Street Artists beautifying the gallery walls and the streets of Stavanger. This years line-up is most impressive with artist David Choe, Swoon, Skewville, Brad Downey, Leon Reid aka Darius and Downey, Chris Stain, Judith Supine, Logan Hicks, Graffiti Research Lab, and Benjamin Wolf in attendance. We are fortunate that Ian Cox from Wallkandy is in attendance for his third year running and will be documenting the entire event. 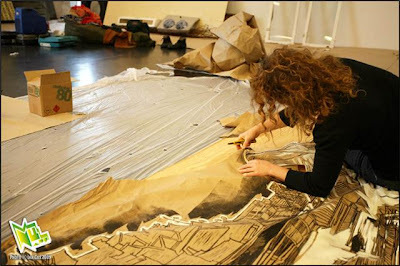 He has began to email us some sneak peak photos of some of the street work and the artists at work in the gallery. We will continue to post more photos later in the week as we get them from him. You can see Ian's entire set of photos over on his flickr here. Skur 2 Gallery and the city streets.